As we see the USD index depreciating to 3 years low against other major currency, it is no surprise that USD pegged commodities saw significant uptrend. Of greater interest is Gold. Earlier in the month when I last posted my analysis when Gold started to forma consolidating wedge with resistance around $1440, there were signs of bearish divergences in RSI, MACD and even STO. When Gold price breakout after $1440, the bearish divergence is immediately seen as a false signal, which is usually so, as it is often used to confirm reversal not vice versa. One famous Technical Trader termed this as – Hound of the Baskervilles’ Signal. We rarely see the Hound of the Baskerville’s signals because they occur only after an unusually strong signal fails to deliver, giving us a sign that something is fundamentally changing below the surface of the markets. That is the time to reverse the initial position and swing in the direction of the new trend! Further retest towards resistance turned support @ $1440 further strengthen the continuation of uptrend towards $1500 target based on wedge breakout & Fibonacci projection. 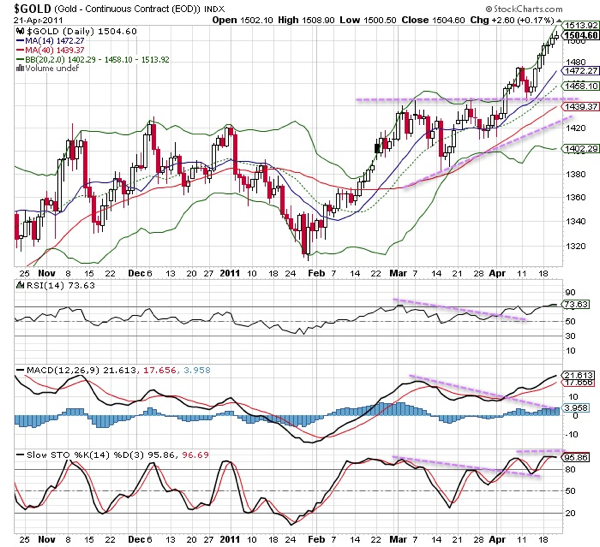 At this juncture, Gold price should see some short term consolidation. Near term support towards $1470.